Electric scooters normally come with detachable seats, chain drives, shocks on both ends, a waterproof control box, front and back disc breaks, and an LED headlight. It’s important to know what each of these features does and how to use them when you start to ride your new electric scooter. This goes without saying. Your scooter comes with a manual, and the best approach is to read it carefully to learn how to properly ride it, and to know how it runs and performs on the road. There is a list of all the specifications that the scooter has. Perhaps you prefer to not have a seat on your scooter, or perhaps you do, but the scooter has no seat at all. You would like a scooter to meet your standards, and if there is a scooter you are looking at that doesn’t have exactly what you want, consider looking at other models. 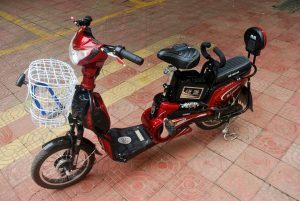 Scooters may seem like harmless recreational vehicles, but it is very possible that you can suffer a fatality just by bumping into an inanimate object. After buying one of a selection of small electric scooters for adults, also consider buying a helmet, knee pads, and elbow pads. If helmets and other protective equipment are strongly recommended to wear for motorcyclists, they are also encouraged for scooter riders as well. Only one on a scooter at all times. Ride alone. A scooter has always been designed to seat one person. Having another person on the scooter, even if it is a child, causes multiple problems that will lead to a fatal accident. The scooter likely won’t be able to support the weight of two people. The balance could throw the rider off. Not to mention that the rider can easily get distracted by having somebody sit in his or her lap. Even accidents that occur at low speeds can cause a fatal injuries and damage to your electric scooter, so never have more than one person riding the vehicle. As long at small electric scooters for adults are used on legal streets, each rider should abide to standard traffic rules to prevent harm to themselves and to other drivers. If you are riding the scooter out on the road, stopping at stop lights, moving at the speed limit, and staying in the proper lane are rules that you must follow at all times. The rules don’t change just because you are on a different vehicle. If you use your electric scooter on pavement, it is important to follow crosswalk rules as well, and only proceed when the signal tells you to walk. The electric scooter is not the type of vehicle to do tricks, like a BMX bike or a skateboard. You are free to do tricks on a vehicle that can handle them, but attempting tricks can severely damage your scooter. What happens when you take an electric scooter to the air is that they add heavy amounts of stress on components such as brakes, joints, wheels, and bearings when you land. Electric scooters are only for getting a ride from point A to point B, so handle it with care to not shorten its life.